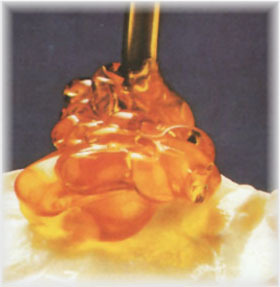 Since antiquity honey has been thought of as a life prolonging elixir and a daily diet should include milk and honey. It was the diet of the immortal Olympian gods. Zeus was raised on nectar made from the larva of a queen bee. Hippocrates recommended honey as a therapy for many ailments, as did Aristotle who believed that the digestion of honey prolonged life. The ancient Egyptians offered their gods honeycombs overflowing with honey as a valuable gift to show devotion and worship. No one, throughout the history of time, has been able to manufacture this natural substance. Kefalonia has two types of honey. Thyme honey is the most favoured it is aromatic and a light golden colour. It is considered one of the best. Made from the nectar of the thyme flowers. The other is honey made from the sap of young fir trees. Traditional sweets are - Mandoles: Made from toasted almonds, covered with sugar and red food colouring. Cruller: Which is made with flour, ground cloves, cinnamon, anise seeds, wine and covered with sesame seeds. Comfeto: This is baked quince with a mixture of sugar, honey, toasted almonds and spices. Barboule: Caramelised sugar mixed with toasted almonds. Anise biscuits: Made of flour, sugar and anise seeds. Nougat: Chewy blocks of sugar, eggs, honey, toasted almonds, glucose and vanilla.